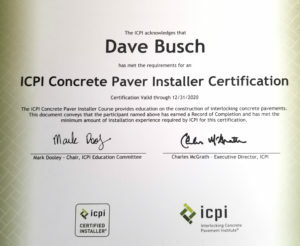 Q: Is the contractor certified by the Interlocking Concrete Paver Institute (ICPI)? A: ICPI sets industry standards that contractors should follow for the installation of hardscape materials. 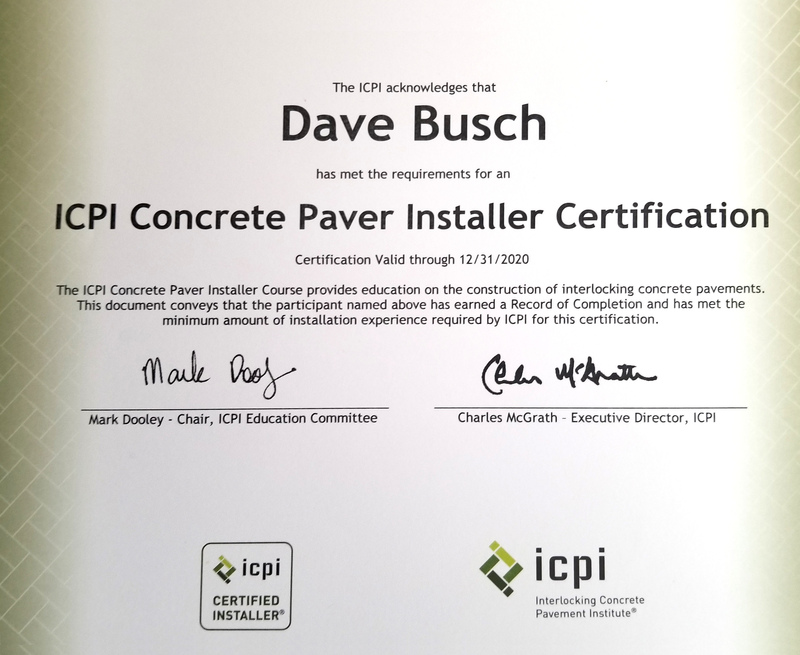 Greenview Designs is ICPI certified and we work at or above industry standards. Ask to see the certifications. 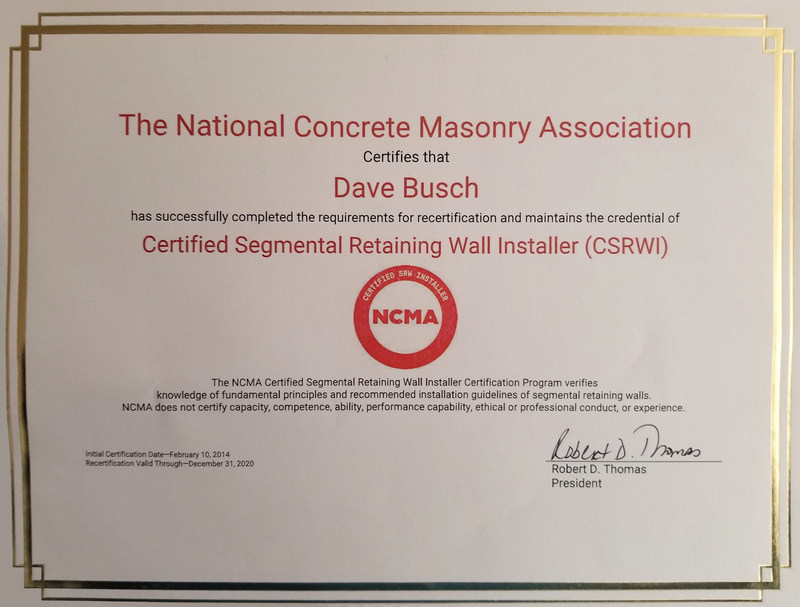 Q: Is the contractor certified by National Concrete Masonry Association (NCMA)? A: NCMA sets industry standards for the installation of landscape and retaining walls and masonry applications. 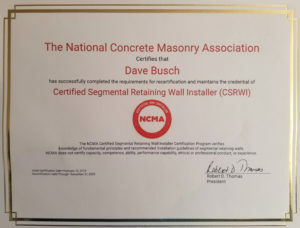 Greenview Designs is certified by NCMA. Q: Installing EP Henry, if so, is the contractor an EP authorized hardscape installer? A: These are extensive manufacturer screenings of contractors which provides offers and guidelines that include a 3 year written guarantee on all work performed, inspections of jobs being built by the manufactures, re-inspections 3 years from completion date, several customer referrals and interviews are required, industry certifications (mentioned above) and insurance certificates to name a few. Greenview Designs is an EP Henry authorized hardscape installer. ****Ask all contractors to see the current certifications mentioned above. **** You can see ours on our website or we can provide hard copies when we meet. 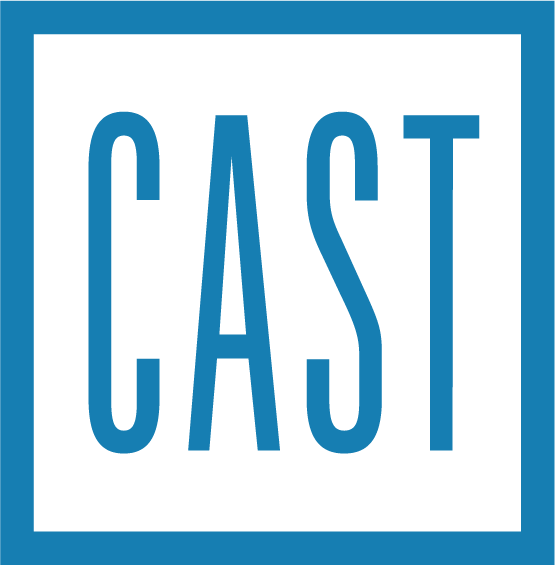 Q: What type of base is your contractor going to install and at what depth? A: Your 1” aggregate blend base is one of the most important aspects of your hardscape project. ICPI recommends a minimum 6” aggregate base. Greenview Designs overbuilds and installs a minimum base of 8” on all of our projects to insure your patio will not fail in the future. We also use top of the line and state of the art heavy compaction equipment to insure proper compaction. note 1: Following the excavation for your walkway, pool deck, or patio, it is very important to compact the subsoil which many contractors overlook. Applying a geo-fabric between the subsoil and aggregate base is the next and very important step in building your base. It creates a barrier between your subsoil and your aggregate base and distributes weight load evenly. Compaction of base materials should occur every 2” to insure proper compaction if using a 4,440lb compactor, however in most cases unlike our competition we use state of the art 12,000 to 15,000lb reversible compactors allowing us to compact 6”-8” lifts of stone and achieve better compaction. In several installs we use heavier rated compaction equipment which increases the depth of aggregate base we can install prior to compaction. Due to the fact your base is very important to the long-term structure of your patio these are very important questions to ask when choosing a hardscape contractor. note 2: Our aggregate blend base extends at least 12” beyond the outer edges of patio installs as well as a minimum of 12” beyond the base for landscape and retaining walls. This prevents any “sagging” or failures along the edges that occur when a base is at the edge of patio’s and walls. Q: What type of setting bed will the contractor apply his pavers or slabs in? A: ICPI as well as all paver manufactures recommend a plus/minus 1” concrete sand bed. Stone dust should not be used as a setting bed as it does not drain instead retains moisture and breaks down over time. If a contractor tells you they are using stone dust in a paver application you are sure to have failures within two years and your patio might need to be picked up and laid again on proper sand materials. In addition you will void the manufactures warranty if you install products on quarry dust. Q: What type of paver joint sealer will your contractor use? A: Use of sand and quarry dust will not hold up over time and it allows water through the paver joints and under your patio. When freeze and thaw occurs and water exists under your pavers it will cause heaving and your pavers will need to be picked up and laid again. Greenview Designs uses polymeric sand (manufactured by Alliance & Techniseal) which is a very fine polymeric sand that we wet and it becomes hard almost like concrete, it withstands 95% of water. Further, most of those unsightly weeds between your paver joints won’t exist as it will with sand and quarry dust. Wind, rain and a blower will also remove sand and quarry dust from your paver joints causing failures. Q: Will your contractor install a plastic paver edge restraint with spikes for all outer edges? A: This is important to hold your walkway or patio in place or in some cases we use a concrete bead along the edge which we find holds up longer than plastic paver edge restraints. Soil conditions will determine what we install. Q: Is your contractor fully insured? A: Greenview Designs carries 3 million in general liability coverage. Q: Does your contractor have their home improvement certification from the division of consumer affairs? Q: Will the contractor obtain all permits? Q: Will they call for all utilities mark outs on behalf of the homeowner and confirm all underground utilities prior to starting your job? Q: What type of warranty are you being offered? A: Greenview Designs passes along all manufacturers warranties for the products itself and we back our workmanship for three years!! If a contractor cannot back his work for three years and put it in the contract you should ask yourself what type of quality your getting. Q: Are you installing a pool? A: Greenview Designs has extensive knowledge of working around pools as we work very closely with the nation’s largest and number one rated pool builder, Blue Haven Pools & Spas by Calvitti. Working with the owners of the two companies directly as well as our staff of architects and engineers makes for a headache free and seem less project. Working around pools involves a lot more knowledge than the typical walkway or patio install. If the contractor you’re considering does not work around pools on a regular basis and cannot provide several recent referrals you will get what you pay for and could be repairing many aspects of your pool project including your pool deck in the very near future. How will the contractor fill the over dig area around your pool? Flowable fill or a sub deck of concrete are two methods that will insure you don’t have future failures. In some cases it’s possible to get proper compaction in such an area using 1” blend materials with proper equipment such as jumping jacks or much heavier compaction equipment. In the end the paver decking around your pool that meets the coping will settle and possibly cause the coping to pop and drop into the pool causing damage to your concrete shell. Expansion joints where the pool deck meets coping must be installed, the bonding loop to meet local codes must be installed at the proper point of the build below your pool deck. How will utility trenches such as electric and gas runs to the pool be filled, this cannot be backfilled with soil, instead properly compacted sand with a trench or jumping jack compactor. Never build on topsoil or fill dirt which many pool builders do, you deck is sure to settle and fail. Q: Does your contractor only use and specify one manufacturer? A: Greenview Designs will install a wide range of manufactures products from EP Henry, CST and natural stone to name a few. Your taste and budget will decide the product we use. Ask about our extensive knowledge of natural stone installs as well. We install natural stone on a dry laid stone bed such as the one mentioned above for pavers or on a 4” thick wet laid or concrete sub-deck on 4” of ¾” clean stone. Q: What range of services can your contractor offer? Do they install low voltage landscape lighting, outdoor cooking stations, outdoor fireplaces and burn pits, outdoor audio and video, masonry services, stone veneers? A: Greenview Designs offers all of these services in house which allows you to work with one contractor to complete your project in a headache free manner and meet your deadlines. Q: Does your contractor offer financing? A: We offer in house applications & approvals and up to $50,000 unsecured and secured loans over $50,000.00 for under 3% or basically free money.